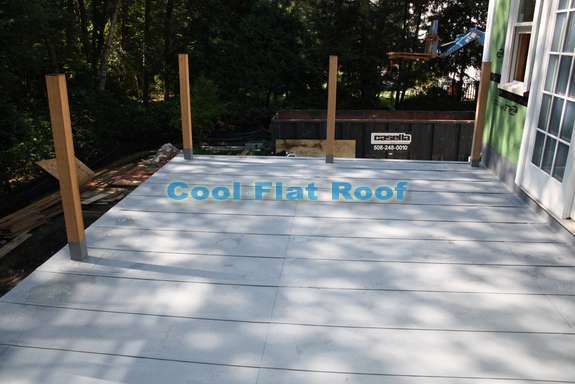 This is a project profile of a flat roofing system installed over a sun-room roof in Wellesley, Massachusetts. The roof system was planned in such a way that a premium wooden deck would be installed over it, and long-lasting water-tightness was the most important aspect, while at the the same time, aesthetics were also important. Wellesley is known for its beautiful mansions and only the best building products (such as an IB Flat roof) make their way into these homes. Having a backyard deck is a great addition to the coziness of any home, and very often such decks are built over a sun room, garage, or other living space. Therefore, having such deck completely watertight is of utmost importance. 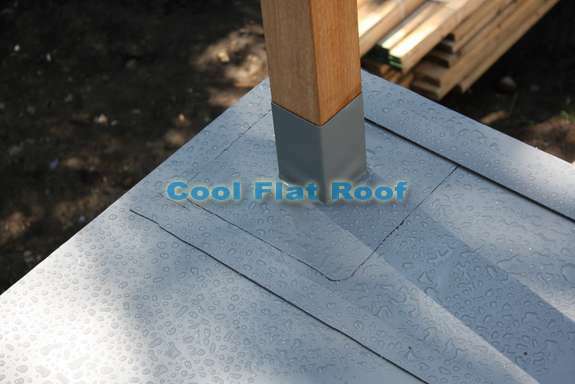 If this flat roof deck leaks, it would be very difficult to trace this leak, since a wooden deck siting on slippers over the waterproofing layer is usually built as one piece, and complete dis-assembly of the deck would be required to find and fix the leak. Each deck must have a railing system. For aesthetic and structural reasons, it is best to install the railing posts through the roof and tie them into roof rafters, rather than attach them to the outside perimeter of the deck. 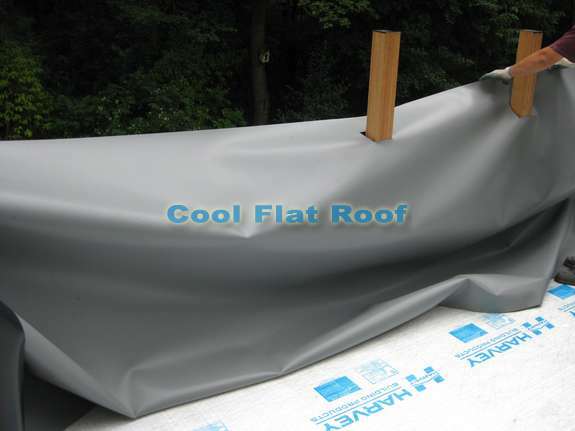 However, to make these through the roof posts watertight using conventional flat roofing systems, such as rubber roof, is nearly impossible in the long run. Because of such high demands for the roofing material to be watertight and long lasting, IB Flat Roof was chosen for this high end residential home. While this home was going through a complete renovation, a large addition was built in the rear of the house including a beautiful sun roof, and a beautiful premium wooden deck would be built on top of an 80-mil commercial grade PVC roofing membrane. When the general contractor was building this garage with plans to have a deck over the flat roof, one of the major concerns was to drain the water off the roof and avoid any ponding water. Having a through roof drain was not very practical as the roof would be divided into 16 sections by the deck slippers and most of the water would never get to the drain. Therefore, the roof framing was built with a slight slope away from the house. 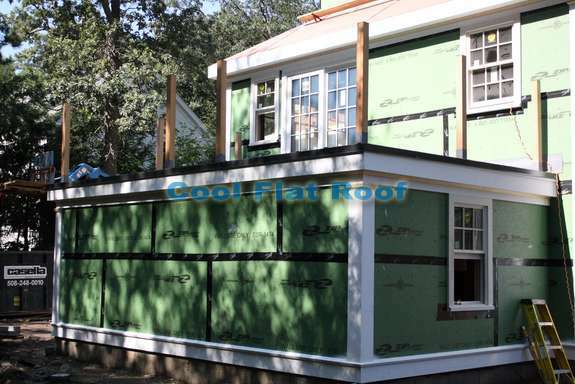 Although this could be achieved with tapered insulation, it is always better to have the framing with a slight slope, especially if there is a rubber roof, which can leak and saturated insulation would settle under the weight of the roof deck. When planning the installation of this roof, we had to take into consideration such factors as deck slippers running across the roof every 16″ O.C., eight through roof railing posts around the perimeter, and a slider door leading onto the deck. Most flat roofs that we install are mechanically attached, using heavy duty roofing screws and barbed steel plates. 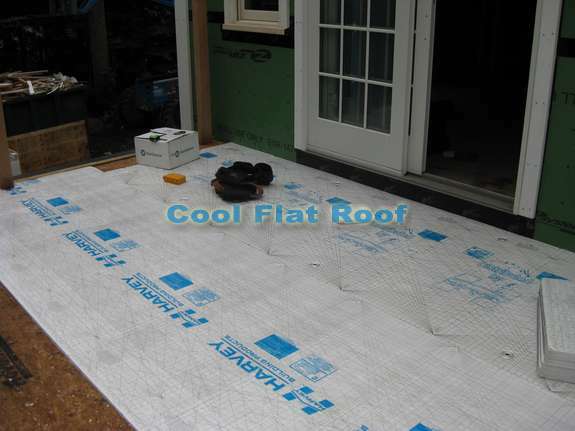 During the installation we had to make sure that all our plates and fasteners holding down the insulation and the membrane would be placed between the slippers laying directly on the roof, to prevent the fastener rubbing through the IB membrane and creating a leak. We marked the spots where the slippers would run along the wall and the drip edge, and using a chalk line, placed all fasteners between the slippers. 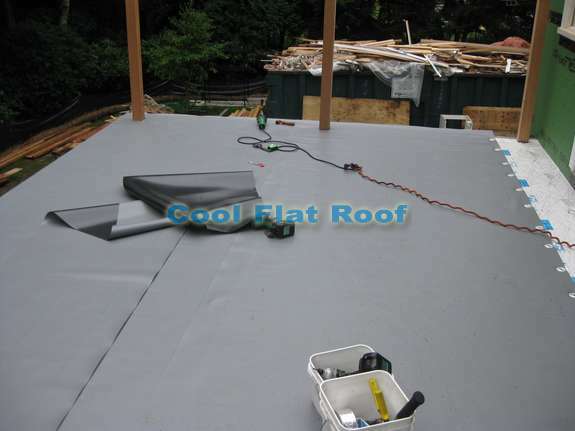 Additionally, once the roof was complete, we installed 2″ wide strips of membrane, tap-welded in place. These strips provided an additional separation layer to protect the membrane from the deck slippers rubbing against it. To make sure there are as little welds (membrane seams put together using fusion hot-air welding process) as possible, we aligned the first 6′ wide sheet of the membrane with the rail posts, pre-cut the holes in the membrane and slid the membrane over the posts. The next two sheets were aligned the same way and attached to the roof. Once in place, the membrane was welded to the custom made 3″ wide PVC coated drip edge, that was made in Bronze color. All seams were welded across the roof, and now it was time to install roof to wall and pre-manufactured one piece post flashings. A quick word about these post flashings – as any other penetration flashing that is a part of IB Roof system, the post flashings are made in the controlled environment to the installer’s specs, to fit tightly around the post and eliminate potential installation errors of in-field flashing using non-reinforced flashing membrane. All we have to do with these flashings is slide them over the post and weld the flap to the roof. That is it – the post is completely watertight. Although the pre-made post flashing costs more than just non-reinforced material, the time saved during the installation and zero chance of a leak after proper installation, make it a much more economical way to build a permanent watertight roof deck with through roof posts. In conclusion, I would also mention that there is an alternative to building a deck over a flat roof – it is IB Deck-Shield, which works just like any other IB roof, but is designed to be slip and puncture resistant and allows you to walk over it just as if it was a wooden deck. If you need to install or replace your flat roof or to build a deck over an IB roof, fill out our roofing estimate form and we will send you an online price quote. Where the membrane finishes up the wooden post would you do a flashing of some description around the edge of the rubber membrane or do you trust the glueing or silicon compound used ? 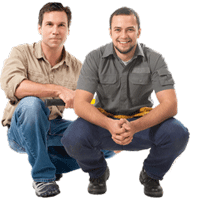 Caulk is more than fine – it’s excessive, but still a good measure. You have to consider, that there will be vinyl post liners installed over posts / flashing. So it’s nearly impossible for these post to leak – unless they are submerged in over 6″ of water. We still caulk, but basically just to make homeowner happy. I don’t think there is any practical benefit. I have a 8 X 14′ flat roof deck that I am installing on my home remodel. I am doing all the work myself [due to finances—unemployed] and so I was wondering is your flat roof deck materials available for the home owner’s installation . . . with instructions, etc.? PVC is a good product depending on the manufacturer and installer. However, to use ill installed EPDM, white EPDM or other roofing type products without credible science or facts does not create trust in your company or PVC product.